The sigil of Great Kourend. Great Kourend is a kingdom in Zeah. It is the only accessible kingdom in Zeah so far, and is larger than Misthalin and Asgarnia combined. The Kingdom is currently ruled by the Kourend Council, and rules over the five Houses of Great Kourend: the Arceuus, Hosidius, Piscarilius, Lovakengj and Shayzien Houses. Players can travel to Great Kourend by speaking to Veos in Port Sarim in the southernmost dock. They can then choose to travel to the Piscarilius House, the easternmost district of the kindgom, or Land's End, the south-western docks near the Kourend Woodland. In order to utilise teleports that take the player to the kingdom, players must have travelled to Great Kourend via Veos at least once. The following section uses date conventions different from conventional formats. The date convention in Great Kourend, according to Arceuus horologist Imerominia, is to state the number of days and decades since the signing of the Royal Accord of Twill. For example, 3,325 - 37 is the 3,325th day of the 37th decade. For convenience, dates in this section will be followed by a conversion of the amount of years that has passed since an event. Decades with BA, short for "Before Accord", following them refers to the time before the Accord was signed. Kourend was founded by refugees fleeing from the mainland during the God Wars; the exact date of this remains unknown. At the time, only the Arceuus, Piscarilius and Lovakengj Houses existed; the Hosidius and Shayzien Houses were founded later during the Dragonkin Conflicts in the Fourth Age about 2,000 years ago. Out of the five Houses, only the Shayzien House's founder is known: Camorra Shayzien, a heroine who fought alongside Robert the Strong, Tristan Corvo and Aivas during the Dragonkin Conflicts. During this time, the Shayzien Crypts were built, burying Camorra there. In the future, these crypts would host the tombs of the kings and queens of Great Kourend. The Tower of Magic, constructed under the rule of King Rada III. Sometime during 6th BA (1,470 years ago), the Tower of Magic was constructed under the rule of King Rada III. The Tower has many powerful enchantments and traps, with many rooms and levels hidden from sight. It is assumed the Tower was used for magical experiments, as Lord Trobin Arceuus is currently using it for such a purpose. During 6th BA, the families of the five Houses rebelled against King Rada III, and formed the Council of Elders. The Council used the chambers in the Tower of Magic as their meeting place, and governed Great Kourend for fifty years from 5th BA to 1st BA (1,460 years ago). The Hosidius House is the provider of a majority the kingdom's food, and remains the largest House in Great Kourend today. Sometime during the rule of the Council of Elders, a famine struck the kingdom. Five years after the famine began, Lord Hosidius IV met with the Lords of the other four Houses, coming to an agreement that half of each House's lands be granted to the Hosidius House in order to grow more crops to stop the famine. The next day, he wrote a letter to the Council of Elders to, once more, grant this request as he had already done so multiple times before. The request was granted, and the famine ends sometime after. Today, the Hosidius House remains the largest House in Great Kourend. The Council of Elders was disbanded during the 1st decade (1,410 years ago) after the lords of the five Houses (Ethrain Hosidius, Seabry Shayzien, Ret Piscarilius, Solange Lovakengj and Bourath Arceuus) wrote the Royal Accord of Twill, a document which detailed the transition of authority from the Council of Elders to the Lords of the five Houses. The document detailed the rotation of succession between the Lords of the five Houses, with one House lord becoming the Grand Lord of Kourend for one decade, and passing the office to the next House lord. Thus, the Lord of the Hosidius House, henceforth known as Lord Hosidius I, ruled Great Kourend for one decade. The next lord to rule was Lord Lovakengj I, then Lord Shayzien I, Lord Piscarilius I and Lord Arceuus I. After the rule of Lord Arceuus I, the cycle would repeat and the Hosidius House would have their lord rule Great Kourend. During the 2nd decade (1,400 years ago), the Winter Beast (now known today as the Wintertodt), an entity of unknown origin, ravaged the lands north of Kourend, causing them to experience perpetual winter, with livestock and crops freezing. The Winter Beast continued to ravage the lands up north for another three decades, with Kourend's attempts to subdue it unsuccessful. On 1,778 - 5 (1,360 years ago), fearing the Winter Beast may eventually ravage Great Kourend, Lord Arceuus I ordered the construction of the Arceuus House Library, filled with texts, documents and research from all houses, in order to preserve the history of Great Kourend. Meanwhile, the most important texts were stored in the Library Historical Archive, a repurposed chamber of the Tower of Magic, for further study and additional protection. On 1,748 - 7 (1,340 years ago), a master Lovakengj smith named Dinh creates a plan to defeat the Winter Beast. Meeting with the Order of the Sacred Flame, Dinh believed that the roots of the Bruma tree, a magical tree lying within the heart of the frozen tundra north of Kourend, can emit the heat required to subdue the Winter Beast. Dinh proposed to construct a large prison in which to lure the Beast in, and seal it with a large set of doors made from various materials, including lovakite and bark from the Bruma tree, with enchantments placed by the Order. The Doors of Dinh continue to seal the Winter Beast to this day. With Lord Lovakengj II approving of the plans, the prison's construction was completed 800 days later, with known casualties of sixteen Order members and two scouts. On 2,548 - 7, after five decades, the Winter Beast was successfully imprisoned and sealed behind the Doors of Dinh, with Lord Lovakengj II declaring the day as Winter's End. The cycle of succession continued until 1,048 - 13 (1,280 years ago) when Lord Shayzien III siezed control of Kourend using the military under his command, crowning himself king. Writing the Royal Charter, he abolished the Royal Accord and formed the State of Kourend, which would serve the monarchy, govern revenues and mobilise forces. During the 20th decade (1,210 years ago), King Shayzien VI married the daughter of Lord Hosidius, and their son was crowned king three decades later (1,180 years ago). He took the name King Hosidius IV in order to distance the family from the breaking of the Royal Accord of Twill. King Hosidius IV ruled for five decades, and his son, King Hosidius V, succeeded the throne and ruled until the early days of the 32nd decade (1,090 years ago). In the early days of the 32nd decade (1,090 years ago), King Shayzien VII took control of Kourend, corrupted by the power of the Dark Altar, an ancient altar with powers that bridge the gap between life and death that has been studied by the Arceuus House for as long as their documented history. During his reign, he was obsessed with the Dark Altar, and had spent a large majority of his time in the Tower of Magic performing experiments on citizens he summoned. Here, he oversaw the construction of various new sections, presumably to conduct magical experiments. Seeking to expand the territory of Great Kourend, on 1,740 - 36 (1,050 years ago), he ordered an expedition to explore the Kebos region west of the kingdom. A team assembled by Lord Shayzien surveyed the immediate area west of Kourend in order to assess the danger and scope of the king's expedition. Thirty-three days later, the survey team returns, reporting findings of a mountain beyond the swamps of the region. King Shayzien VII then ordered to have the mountain as their main focus for the expedition, and assigned Magnus Rimor, a Shayzien commander and seasoned explorer, as the party leader. After a week of interviews, Magnus selected five more members for his expedition: Doctor Bev Crushim, Lieutenant Thomas Berlin, Sergeant Henno Garvie, Corporal Rytin Edshirt and Corporal Keith Jones. With the party assembled, King Shayzien VII approved of the expedition plans on 1,800 - 36, giving the party 250 days to ascend the mountain and return with details of their findings. The party never returned. Assuming the party perished in the field, the king declared the expedition a failure; the mountain would become known as Mount Quidamortem, meaning "certain death" in Latin. During this time, King Shayzien VII also ordered the construction of a prison in the Tower of Magic. An ancient temple housing an unstable altar, constructed sometime after the Great Expedition and before Xeric's reign. However, a temple was constructed, presumably under the orders of King Shayzien VII, in a cave on the western side of the mountain sometime during the 37th decade (1,040 years ago). Within the temple, an unstable altar was created, giving off a similar power to the Dark Altar, while having the ability to amplify the true Dark Altar's powers, allowing it to reach areas it previously could not. Here, the natives species of lizards in the Kebos region were experimented on, creating creatures such as the Corrupt Lizardman. King Shayzien VII noted in a journal he wrote during this time mentioning compatible creatures in Quidamortem for mass production, suggesting he was creating the lizardmen as an army for Kourend. Records of the experiments that remain imply that the process involved a combination of the breeding of humans and lizard creatures using dark magic. A weathered statue depicting an ancient Xerician priest, or possibly Xeric himself. Sometime during the late 37th decade, the Battle of the Concourse began. King Shayzien VII was eventually killed in the battle on 3,316 - 37, ambushed by his own army of Elder Warriors; however, his body was never recovered. A few days after the battle, Xeric appeared and was said to have had a similar appearance to Shayzien VII. It was quickly discovered that he had used the power of the Dark Altar and moved his spirit from his mortal body into a corporeal one. With this newfound power, Xeric proceeded to kill the remaining Lords of the Houses, and claimed Great Kourend as his own, using the lizardmen he had mass produced in Mount Quidamortem as his army, serving him as guards and enforcers of Great Kourend. The lizardmen would sweep cities and farms, kidnapping people for his experiments. At the height of his reign in the 43rd decade (980 years ago), a resistance group called HAX (Humans Against Xeric) attempted to storm the Tower of Magic and defeat Xeric, but had failed, resulting in the loss of two hundred members. A portrait depicting an artist's impression of King Byrne I. During 312 - 47 (940 years ago), Byrne, a farmer, witnessed a lizardman guard murder a child whilst working his farm. Outraged, he slaughtered the lizardman, with the entire town as witnesses. Urging the people to fight back, the people revolted, and within seven days, the lizardmen were outnumbered and driven to the caves beneath Kourend and beyond the city. During the revolt, the temple surrounding the Dark Altar was destroyed as well, weakening Xeric's power and forcing him into exile, travelling west to Mount Quidamortem. After the successful revolt against Xeric, Byrne was crowned king of Great Kourend on 339 - 47, and ruled for three decades as King Byrne I, and his son King Byrne II ruled for another two decades after his father. Sometime during the reign of King Byrne II, he died of unknown causes, and his wife, Biyrene, was crowned as Queen Biyrene I, as their son, King Byrne III, was too young to rule the kingdom. During her reign in the 53rd decade (880 years ago), she took Lord Piscarilius, who was responsible for Kourend's spy network as Lord of Intelligence, as her consort, and birthed a daughter, Queen Biyrene II. Once her son, King Byrne III, came of age, she unwillingly gave up the throne. Had the law of succession made by her late husband never existed, she would have not given up the throne for her son, wishing to finish the work for this kingdom that she had started. During King Byrne III's reign in the 54th decade (870 years ago), he was stabbed to death in his chamber by an assassin. As King Byrne III had not achieved anything of note during his reign, it is believed that the assassination was arranged by Lord Piscarilius through the spy network in order to return his wife to the throne. Queen Biyrene I would rule for another two decades before passing the throne to her daughter, Queen Biyrene II. Sometime during the 121st - 123rd decade (200 to 180 years ago), a civil war occurred in the kingdom. During this time, there was no ruler. Nothing else is known about this event. Varlamore, a kingdom south-west of Kourend, was founded during the Age of Strife approximately 1,000 years ago, and maintained a stable relationship with Kourend, managing to avoid any conflict with the kingdom. As part of a celebration of his 30th birthday some years ago, Emperor Imafore invited the Kourend royal family of the time to Varlamore, and gave them a grand tour of the kingdom. However, during the grand feast at his palace in Civitas illa Fortis, he killed the royal family by poisoning their drinks, prompting Kourend to declare war on the Kingdom of Varlamore. The war had ended sometime before or during the reign of King Kharedst III in the 132nd to 134th decade (90 to 70 years ago). In the hope of repairing the relationship between Kourend and Varlamore, which had been destroyed after the war, the King ordered an envoy be sent to Varlamore to transport the Royal Accord of Twill to be displayed in the Grand Museum of Civitas illa Fortis. However, the Accord became lost at sea, and remained so until it was recovered by Artur Hosidius in the 141st decade. Today, the betrayal of Emperor Imafore remains fresh in the minds of Kourend's people, and their trust has yet to be regained, although Varlamore has sent one of their knights to the Kourend Castle on a mission to, presumably, ease tensions between the kingdoms. A statue of King Kharedst IV, the last King of Kourend. In the 139th decade (20 years ago), King Kharedst IV died after ruling Kourend for four decades. As his wife died giving birth to his only daughter, Rose, who was too young to take the throne at the time of his death, the Kourend Council was temporarily formed in order to rule the kingdom until Rose came of age. However, the Council declared that Rose became insane after the death of her father, and considered her unfit for rule. Accused of killing her father, she was locked away. With no suitable heir for Kourend, the Council was made permanent, with the kingdom now known as The Republic of Great Kourend. Since the incident, the Council has been accused of corruption, with conspiracy theorists claiming the convenience of Rose going insane, and the same four councillors winning every quadrennial election since their formation, along with Councillor Sophia Hughes' ties with the Disciples of Yama, a cult who follows the demon Yama, who resides deep below the Chasm of Fire. A secret page in Kharedst's memoirs reveals Rose did not become insane after her father's death, and that he was killed, although the page does not reveal the assailant. Nearly 940 years after Xeric was exiled out of Great Kourend, he has begun planning his return, possessing Veos and using him as a conduit to have an adventurer help a client (himself) gather knowledge on the current state of Great Kourend's hierarchy and general social organisation. Throughout Kourend's history, there are three known events that are named, such as the Age of Strife, the Ascent of Arceuus and the War of the Five Houses. However, there are currently no known dates or details in which these events occurred. Of the three events named, only the details of the Ascent of Arceuus is known. During this event, the Arceuus House managed to achieve immortality by using the power of the Dark Altar, moving their soul from a mortal body to a corporeal one, much like Xeric during the 38th decade. Great Kourend can be accessed by speaking to Veos in Port Sarim in the southernmost dock. Doing so will take players to either the Piscarilius House, the easternmost section of the city, or Land's End, the south-western docks near the Kourend Woodland. Players are able to choose to which point they want to be taken. Players may use the Kharedst's memoirs book to teleport here after completing the Client of Kourend quest. This book allows players to teleport to each of the houses. Players with level 25 Construction can have their Player-owned house moved to the Hosidius House north of the Charcoal furnaces for 8,750 coins. Players may also make use of a Kourend teleport tablet, made by combining a Teleport to house tablet and a Scroll of redirection if they do not wish to move their house. This still requires level 25 Construction. In the Arceuus House Library players can find transportation incantations, a book which will unlock the Teleport to Kourend spell. Finding the book does not require helping the Arceuus House. Location of the book changes with world. A fairy ring, code CIS, will take players north of the Arceuus House Library. Players must pay a one-off fee 80,000 coins to Trossa in order to use it. The fairy ring DJR teleports players near the Chasm of Fire. Players may receive Xeric's talisman from lizardmen, which can be charged with lizardman fangs. The talisman can teleport players to Shayzien, Hosidius and Lovakengj. Players can also gain access to the mine cart transportation system that runs beneath Kourend at 65% Favour in the Lovakengj House. To open this mode of transport you must first speak with Miriam. Players can use a Games necklace to teleport to Wintertodt Camp, in the northern area of Great Kourend. With the addition of the Woodcutting Guild, the Skills necklace also provides a teleport to Great Kourend. There is only one requirement to use this teleport: you must have travelled to Kourend at least once before. The Kourend Favour interface found within the Quest List interface.
) for an individual House to gain favour from them. Once players have gained a certain percentage of favour from a House, they will be able to access more of the House's features. For example, the Arceuus House requires players to have 60% favour before they are given access to the Arceuus spellbook. Earning favour for a House will cause favour gained for any other House to decrease, unless players have started the Architectural Alliance miniquest, and have locked in their favour after reaching 100% favour in a House and talking to that House's architect. By default, an overlay interface is displayed in the top-middle of the game client when the player is in Great Kourend. Hovering the mouse over the overlay allows players to view the percentage of favour the player has within a House in Great Kourend, as well as a small button on the right-bottom corner to view favour-gaining tasks and milestones for gaining a certain percentage of favour. Players can remove the overlay by clicking the small purple icon in the Quest List and disabling the Favour Overlay. The Arceuus House Library, where players can assist customers in seeking texts found in the library. The Arceuus essence mine, where players can mine dense essence blocks, which are processed to create fragments used to create blood and soul runes. The Dark altar, an ancient altar that allows players to process dense essence blocks into dark essence blocks. Tyss, a wizard who will allow players to access the Arceuus spellbook, which contains spells for necromancy. The Tithe Farm, an intensive farming minigame. An allotment patch, vine patch, and spirit tree patch. Saltpetre deposits which are used in the creation of dynamite and sulphurous fertilisers. Charcoal furnaces, which are used to burn juniper logs into juniper charcoal, an ingredient used in dynamite. The mess, where players can feed Shayzien soldiers for favour and cooking experience. A general store, Little Shop of Horace. A farming store, Vannah's Farm Store. Two pubs, The Golden Field and The Haymaker's Arms. The Woodcutting Guild, contains many low to high level trees, including the exclusive redwood tree. The sulphur mine, which is the only mine containing volcanic sulphur. The lovakite mine, which contains lovakite rocks, coal rocks, and a bank. A pickaxe store, Toothy's Pickaxes, that sells pots in bulk. The blast mine, where players blast rocks with dynamite to obtain ores. The combat ring, where players obtain Shayzien armour. 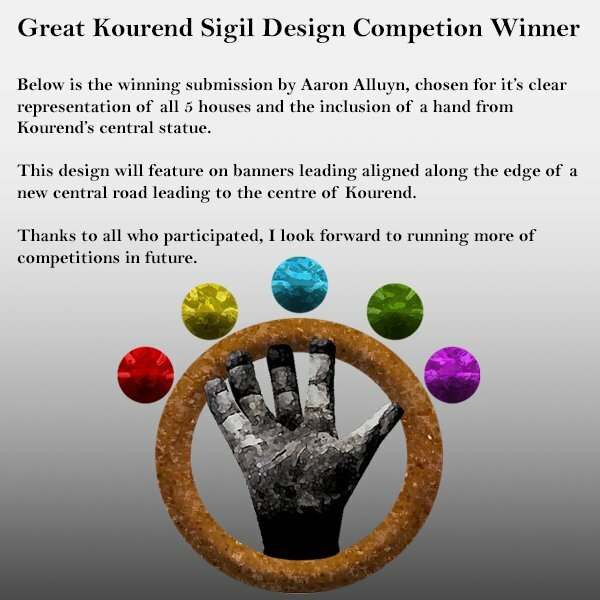 The sigil of Great Kourend was designed by a player named Aaron Alluyn, who submitted the winning submission as part of a competition ran by Mod Ghost, a senior graphics artist in the Old School RuneScape team. The shape of Great Kourend used to be noticeably more rectangular and the borders between the five houses clearly distinguishable. It was redesigned in an update on 17 November 2016 due to a viral Reddit post that was posted in July of 2016 suggesting to make the continent more consistent with the rest of Old School RuneScape's landmass. This redesign also added several areas, such as the Fishing Hamlet, Kourend Woodland and Land's End. Previously, this kingdom was a labelled as a city, as described from the world map label on release. This was also changed with the redesign, in which it was relabelled as a kingdom, although the correct label would be "The Republic of Great Kourend", as the current ruling power is the Kourend Council, rather than a monarch. The ancient machinery, a tractor, in tribute to Reddit user GentleTractor. North of the Kourend POH portal, just outside the windmill, there is a tractor labelled as "ancient machinery", with the examine text stating Some form of ancient terraforming device, in need of repair. This was added in with the update that redesigned Great Kourend entirely, paying tribute to Reddit user GentleTractor, who proposed the redesign in a viral Reddit post. ↑ Jagex. Mod Ghost's Twitter account. 11 February 2016. Mod Ghost: "Thanks for all who took part in the Great Kourend Sigil Design Competition, here's our winning submission. "